Breathtakingly beautiful!! Wow, are you talented! I have mist these cards from you the landscapes. 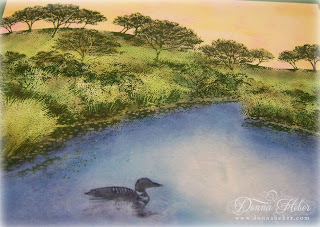 This is really beautiful Donna - you are incredibly talented. The colours you have chosen are gorgeous and I just loved reading the names - Handsome Hunter Hmmm - I think that was the best one. A lovely peaceful scene. I love how you blend all those colors together! So very talented! This is gorgeous Donna. I love how the grass came out, it looks so real. Wow Donna! This is a masterpiece! This is gorgeous! I hope you plan on framing this little gem. Love the color you used for the sky. It feels like a warms sunny morning to me. Oh my, this is ever breath taking! What a work of art in a small paper form ... Such rich colors and beautiful scene you've made here. I instantly went straight to thoughts of Versailles when we visited France (Paris) and sat on the grass overlooking the water. Beautiful!! Simply stunning - saw the thumbnail on MIM and came in for a closer look. Glad I did! This is gorgeous. I love the colours and the fact that this scene only used four stamps. I saw this on MIM and had to have a closer look. 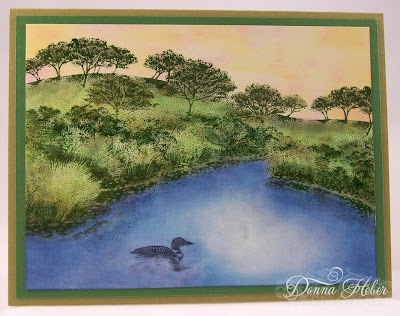 Hello Donna, your card is stunning, i saw it on MIM and had to take a closer look. This is a really WOW-Card, with only 4 stamps, WOW. Beautiful scene Donna. I'm hosting a big scenic stamping this week for our group, 21 will stamp our hearts out this week. Kevin is coming from Stampscapes so it's always fun to have him here. Breathtaking Donna! Absolutely love it! Beautiful scene you have greated Donna. The colour of the sky looks amazing. Remember, to be in the running to win the prize from our sponsor this week just leave a comment for another entry. Be sure to mention you saw them on MIM. The more entries you comment on the more chances you have of winning. Gorgeous! I love the tranquil scene you created.